Weddings are the most auspicious and arguably the most awaited moment in life. 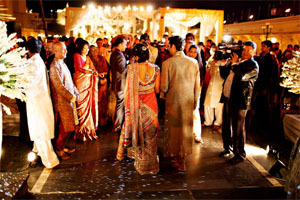 Weddings at Hotel Aakashdeep have an aura reminiscent of the most royal of the weddings. 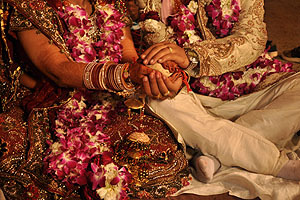 By seamlessly marrying tradition to modernity and comfort with elegance, we are well prepared to host your holy union. For a traditional yet unconventional wedding, Hotel Aakashdeep is one of those rare venues in the city that is known for its understated elegance. A beautiful banquet hall awaits you that can host weddings and parties for up to 300 people. Even minute details such as acoustics, lighting and seating have been given exemplar attention. To back it all up, we provide an impeccable service and a menu that offers the choicest cuisines. So whether it's a seminar, conference or a party you couldn't do better than choose one of our banquet hall. Special occasions like weddings, pre wedding/post wedding functions or special affairs with family, friends, or colleagues require special attention and most certainly a special and exquisite venue. Luxurious flooring, wall-hanging, furnishings create an atmosphere of idiosyncratic elegance. Our banquet hall is completely soundproof, thus providing privacy for your special occasion. We serve your occasion with decoration of your choice, attractive lightings and flowers. Best stage decoration required as per your occasion. Food menu decided by you will be served with tastes decided by you. We provide standard services for any occasion like theme wedding, wedding, social get together, any social events, conferences, birthdays, seminars etc.